Around March 2014, my colleagues and I took part in a journalistic competition called “Guido Martinotti Prize”. The work we submitted – a 3-minute video and an article regarding the struggle of a group of Milan citizens to re-open an abandoned tunnel in their neighborhood – did not obtain the prize. However, this experience taught me a few things about journalism. Here’s the story. As soon as the video selected for the first prize began on the screen of the crowded meeting room, I realized that we hadn’t won. «We lost». The second thought I had was about all the labor and the Sundays my team and I had spent on our video project. We decided to take part in the competition six months before, just after the official release of the rules. The first edition of the Martinotti Journalistic Prize seemed to be a great occasion to become known and to get a little money, not to mention its appealing subject: The care of a specific neighborhood of Milan taken by a group of citizens. For a person such as myself, who loves city reporting above all other journalistic specializations, this topic was perfect. However, I knew I would have to work on a team in order to win. As I learned by experience, when you have to achieve a journalistic inquiry for TV you have to work with a colleague at least. The reason in simple. One person carries the video camera and the other one holds the microphone. In order to participate, we had to present a video and a written text. My team was composed by Enrico, who is good at video editing, Silvia, who has any phone number you need in her agenda, and Silvia, who has a special ability in getting in touch with strangers and interviewing them. Last but not least, there’s me. As the writer. Our story was about a group of citizens from northwest Milan, who were trying to re-open an abandoned tunnel which split up their neighbourhood. Before the selection, I believed we had some likelihood. The prize went instead to a group of students from the Cattolica School of Journalism. They made a great video filmed in almost every part by night, about the homeless soup kitchen in the Milan city centre. Their work deserved the first prize. I admit it with no envy or rage. After the selection, I had a little conversation with one member of the jury. He remembered clearly our work. He gave me the following: we presented a very good text and a not outstanding video. On the contrary the winners presented a not outstanding text and a very good video. «So we favored Cattolica’s students because their journalism is more modern». What have I l learnt from this? That’s the future press, baby. The future press! And there’s nothing you can do about it. “A free press, like a free life, sir, is always in danger”. Another quote from the movie Deadline U. S. A. 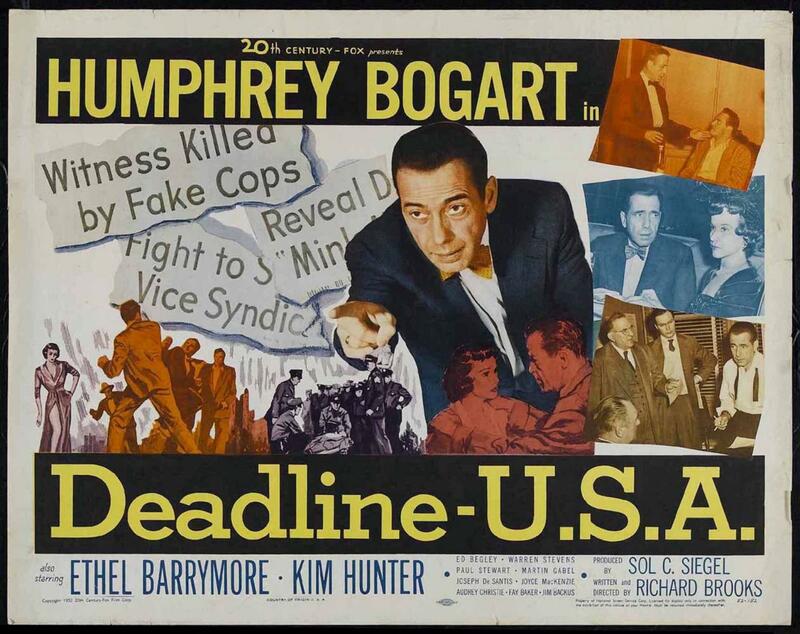 (1952), starring Humphrey Bogart as Ed Hutcheson.